VFC Concentrator | KATSURAGI INDUSTORY CO.,LTD.- Dryers,Drum Flakers,Concentrators,Crystllizers. Heater is of vertical tube type, in which liquid is caused to flow down for heat exchange with the heat source provided outside the tubes. Liquid is boiled and evaporated inside the tubes, then flows down into the concentration tank in high-speed dual-phased stream. 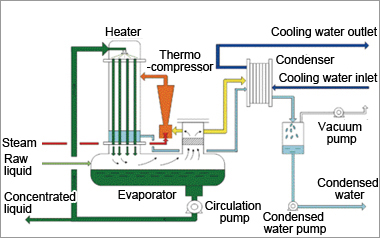 Fluid component is sent from the concentration tank to the upper part of the evaporator with the circulation pump. Evaporated steam contacts the liquid surface, and mist is separated and led to the condenser to take out condensed water, of which steam separating-efficiency is high and water quality is superior. 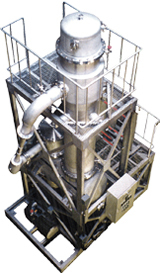 This system is suited to the bubbling liquids and organic component-containing liquid such as juice.